The Trinity War is over and apparently, all three Justice Leagues are dead. At least that’s what readers are led to believe, especially since we haven’t seen too much of them since the arrival of the Crime Syndicate. Pandora was led to believe that if the box was opened, the world would be rid of evil for good, including the seven deadly sins. Turns out that it was all a charade orchestrated by the Secret Society. Pandora’s box is actually a portal to a parallel universe, home of the Crime Syndicate. 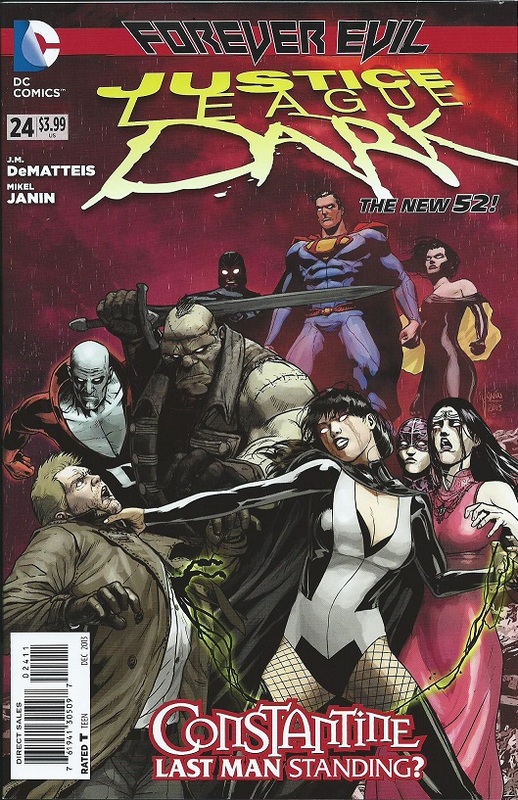 However a member of the Justice League Dark has survived the catastrophe, and struggles to remember how and why. John Constantine, the leader of the Justice League Dark, was saved by the House of Mystery. After regaining consciousness and recalling the events of the war, Constantine is paid a visit by numerous tiny monsters. The monsters all resemble Constantine, and one of them is even smoking a cigarette! The tiny Constantine monsters reminds me of the little Ashes in Army of Darkness. If you’ve seen that movie, then you will definitely appreciate this issue of Justice League Dark, one of the New 52 titles by DC Comics. In case you don’t know, John Constantine is an occult detective. This magician is also a con artist who is despised by many, uses trickery to get out of dangerous situations (usually when he’s captured by enemies), likes to tell jokes and smokes constantly. I enjoyed this issue, especially the Constantine monsters and the visit from Nightmare Nurse. But I don’t know if I can trust her. I don’t have a choice but to wait for the next issue to see if she’s truly helping Constantine, or if it’s an effect from Pandora’s box. J.M. DeMatteis is the writer of this dark and hilarious script. I found the tours that Constantine received from the House of Mystery to be inspiring. He was given an intimate look at suffering and sin. And if you know Constantine, then you know he remains calm throughout. I like the character interactions, especially Constantine. He is suave and can talk himself out of the most dangerous situations. Great artwork by Mikel Janin (artist and cover) and Jeromy Cox (colors). The panels with the little Constantine monsters are awesome. Funny as heck, but awesome. I read this title every month so I should have known better than to read it at night. So now I’m sitting here afraid of that giant serpent that’s composed of all the billions of sins and evils. Dark, gray tones, thunderstorm. Great visuals throughout the book. I have been a reader and fan of dark magic since childhood, and I am enjoying Justice League Dark. I definitely plan to continue reading this title. I highly recommend this DC Comics New 52 title.